This is a wonderful "confort food" dish - which is really very easy to make. 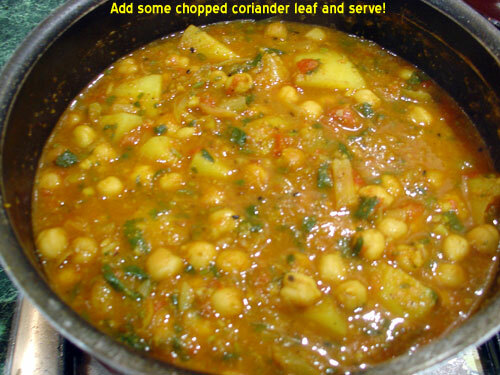 Channa Masala is spicy masala chickpeas - and can be as mild or as hot as you like it! It is a classic North Indian vegetarian dish - and is either eaten with rice or roti (chappati) as a main meal - or is served as a side-dish with a non-veg dish e.g. chicken or lamb. When served as a main meal - it is especially delicious when eaten with a kind of bread called "bhatura" - which is a deep-fried bread. It is also served as a mid-afternoon snack in the form of a "chaat" - which is when it is mixed with a couple of spoonfulls of imli (tamarind) chutney and poured on top of a broken samosa with some sprinkling of bhel puri or "sev" fried bits. This is spot-on Indian "street-food". Absolutely delicious! 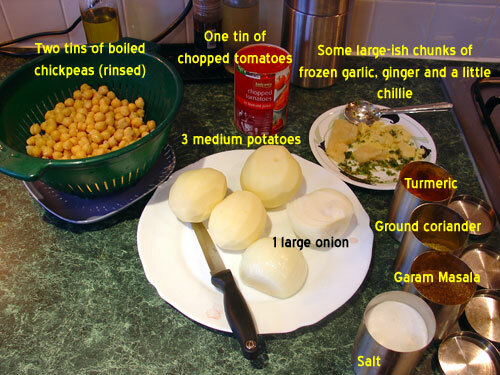 Some Punjabis may know this dish as "chole" (pronounced "cholay") - and some of you may recall that I made a packet-mix version of this tasty dish. Click here to see that method. Seeds: Onion seed and Cumin (Jeera) seeds. Heat the oil in the pot until hot. 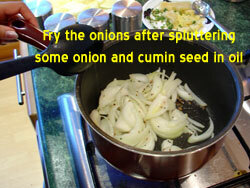 Add the onion and cumin seeds and watch them pop and fizzle for around 20 seconds. 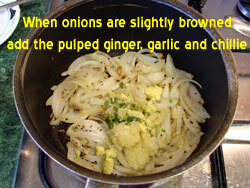 Then add the chopped onions and fry until they are lightly browned. Then add the frozen (and by now thawed) chunks of pulped ginger, garlic and chillie. Stir fry on medium heat. Stir it all thoroughly on medium flame. 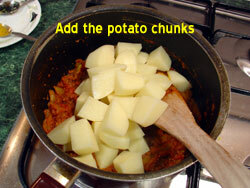 Then add the chunks of potato - stir until well coated in spices. 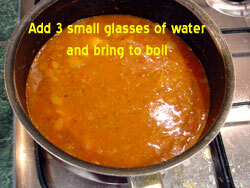 Then add around 3 smallish glasses of water into the pot - and put the lid on and bring to boil. 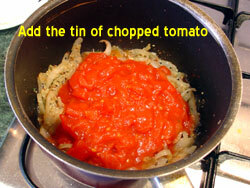 Let it simmer on a very low flame for around 20 mins with the lid on. This will soften the potato. 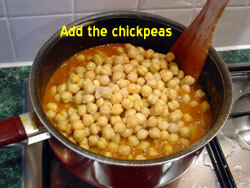 After about 20 mins - check to see that the potato chunks are soft - and then add the drained (already-boiled) chickpeas. 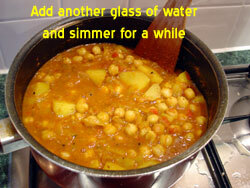 Stir it all up - and add another small glass of water to the pot. 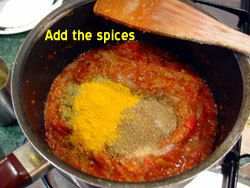 Bring to a fierce boil and then turn the flame down to simmer the pot for a while - with the lid partially on. After about a further 15 mins of simmering - add some freshly chopped (or frozen) fresh coriander leaf and stir it all in. Keep it simmering for about 10 mins more. After that - turn off the heat - put the lid on tight - and let it it stand for around 15 mins whilst you make some basmati rice - or warm some pitta bread etc. It's then ready to serve!